The pyramids now are in ash color and appear dull. By observing keenly they look as if they were built with just stones. Pyramids may not look beautiful now as they appear in desert color. But once pyramids were milky white in color and glittered well. It is surprising to know that they were so smooth like a glass building at that time. Moreover at the top of these pyramids, gold coatings were present. They used to shine in gold color in the morning sun light. Although pyramids were built with stones, different types of stones are used at various places. They have kept mud bricks inside the pyramids. Above them, they built with cheap marbles and above them costly marbles were laid. At some places in the walls, they have also used granite stones also. Pyramids built in that way looked very beautiful in those days. 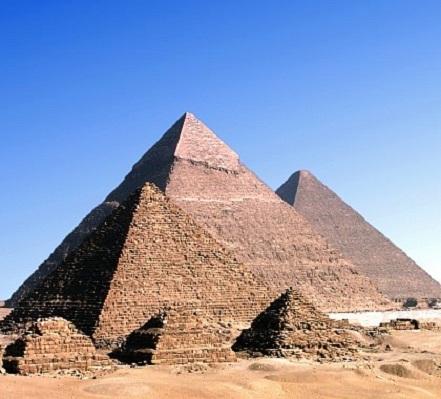 But the dull appearance of pyramids now is due to the invasion of Arabs. After conquering the Egypt, they took away the gold plating at peaks and expensive marbles from the pyramids. They have built mosques and palaces with those costly marbles in Cairo, capital of Egypt. In that way, pyramids have lost their actual beauty and color.